A fire destroyed the contents of a Pahrump business owner’s warehouse on the 2700 block of East Charleston Park Avenue just after 5 p.m. Wednesday. Selwyn Harris/Pahrump Valley Times Michael Kolpak, right, investigator with the Nevada State Fire Marshal Department of Public Safety, inspects the aftermath of a warehouse fire that broke out Wednesday afternoon along the 2700 block of East Charleston Park Avenue. Kolpak said he believes an electrical malfunction in a motorhome parked in structure was the origin of the fire. Selwyn Harris/Pahrump Valley Times John Benedict, center, owner of Pahrump's JonAire Heating, Cooling and Refrigeration, speaks to Michael Kolpak, investigator with the Nevada State Fire Marshal Department of Public Safety about Wednesday's fire which destroyed several vehicles, including his $100,000 motorhome. Day-to-day operations of Benedict's business were not affected by the fire. 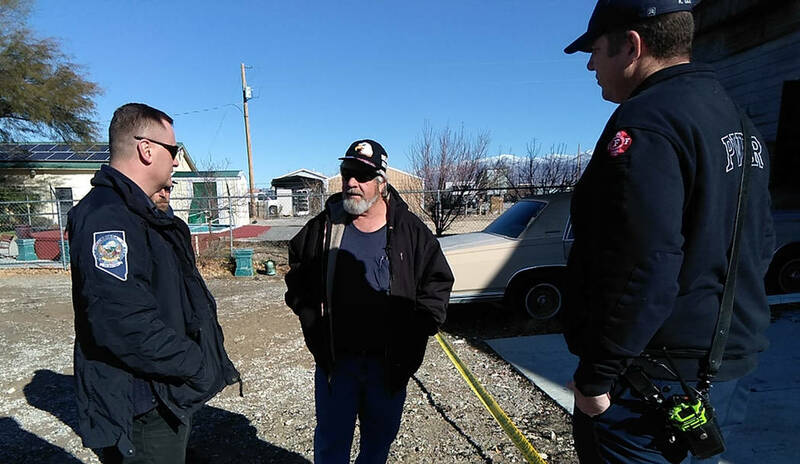 John Benedict, owner of Pahrump’s JonAire Heating, Cooling and Refrigeration said he’s fortunate the fire did not affect his day-to-day operations, as the warehouse was not part of his business. Benedict noted that it was a neighbor who called him and 911 after noticing smoke and flames coming from the roof of the structure. Though no injuries were reported, Benedict said the fire destroyed his motorhome and damaged several vehicles stored inside the structure, which also housed many other of his belongings. As far as a dollar amount in terms of damages, Benedict estimated it to be in the six-figure range. On Thursday morning, Michael Kolpak, investigator with the State Fire Marshal Division, arrived on scene. Benedict, meanwhile said he’s going to carry on despite the loss. 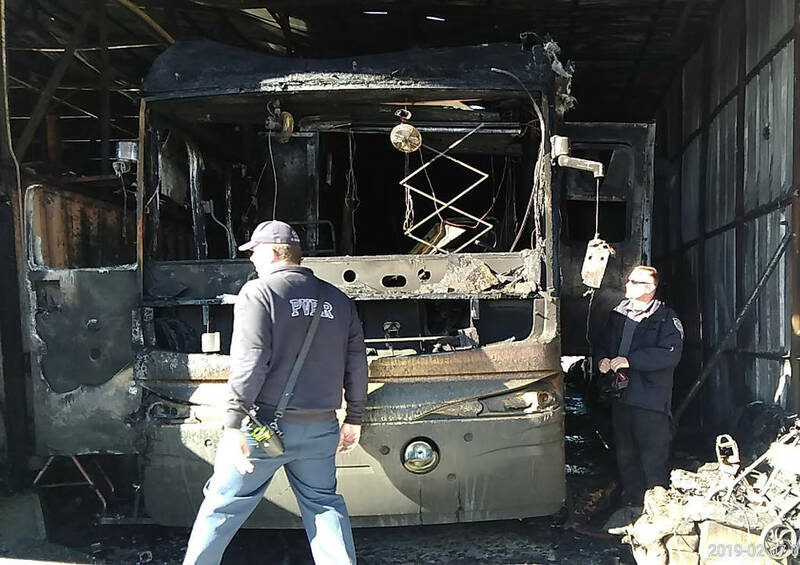 At the height of the fire, Pahrump Valley Fire and Rescue Chief Scott Lewis classified the scene as a “high-risk assignment,” as there was at least 100 gallons of diesel fuel in the motorhome’s fuel tank. When asked about recouping his losses, Benedict was not entirely certain. Regarding his business, Benedict said he’s thankful things are going well. Benedict also praised the efforts of first responders, who quickly arrived on scene once they were dispatched. It took roughly five hours before firefighters cleared the scene.